Add lights to your pipes! Add lights to your pipers. Simply remove your existing end caps, install and plug into OEM wiring harness. 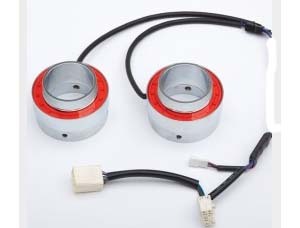 Has run, turn and brake controller built in (controls these lights only). Turn signal illuminates Amber. Made from aluminum with chrome finish or black powder coated. Lights are LED adn heat-tested to 500 degrees Fahrenheit. 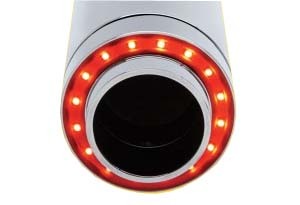 Placement lighted muffler 4" tips with a three function red, run and brake and amber turn signal function. Available in chrome or black and for most 4" mufflers with removable end caps. Comes complete with plug-in wire harness. Sold in pairs for use with duel exhaust.